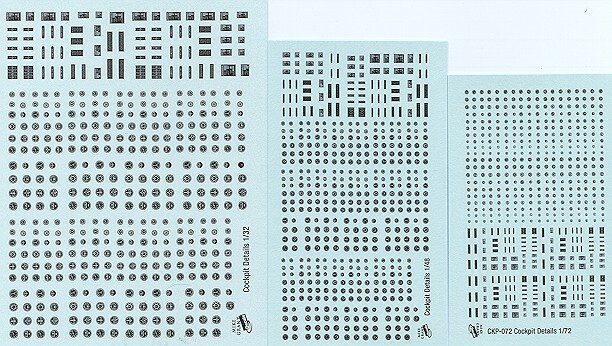 The latest goodie from Mike Grant Decals are these sheets for standard instruments in 1/32, 1/48, and 1/72 scale. While there have been similar decals in the past, none have come to the level of detail that Mike Grant has placed in these sheets. The quality and resolution of these decals is very impressive. These are ALPS printed decals so are on a single carrier that requires each marking to be cut out. There are a goodly number of different instruments to allow you to fill many panels. There are also some switch panels and instrument groupings provided as well as a number of placards. All decals have the appropriate backings so no additional prep is required before use.